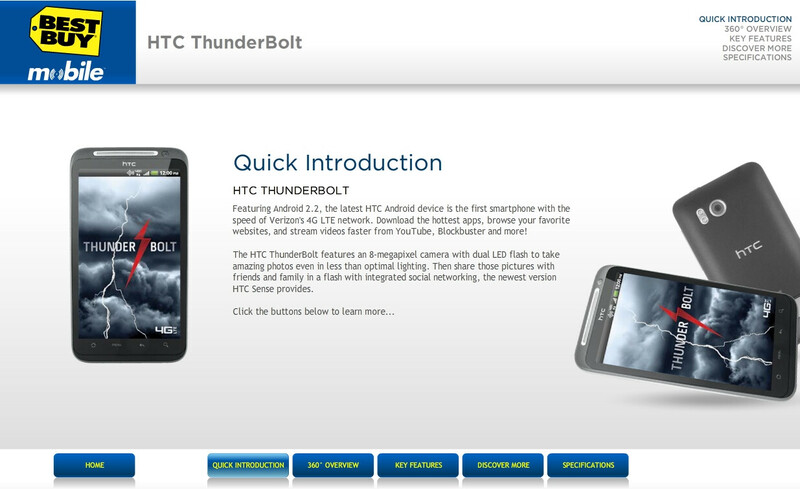 If you've been waiting for Verizon's HTC Thunderbolt to be released, it looks like things may be getting a bit closer, as the Best Buy site now has an on-line simulator for the phone. It still doesn't give a release date, which has been rumored from last week through February 28th, but keep in mind you can pre-order it with a $50 deposit at their store locations. The simulator shows some information about the phone, such as 360 degree overview of where the power button, earpiece and camera are located (like you couldn't figure that out yourself? ), as well as how to use the software, streaming video, and camera. Under the 'discover more' section it will guide you on how to download and install apps though the Android Market, connect to a Wi-Fi network, use Google Maps for driving directions, setup and pair with a Bluetooth device, add and remove desktop widgets, and how to setup the Wi-Fi Hotspot. All of this is pretty basic stuff, as nothing too advanced is shown, but at the end it does list all of the phone's specifications. It's still not a release date, which is what everyone is waiting for at this point, but there are also listings on the Best Buy site for the Thunderbolt's screen protector and purple soft-shell case. I've become numb from the anticipation of this phone. Hate to tell you guys this but that simulator has been there for a couple of days. I know I saw it on Friday (the 18th). I went in to Best Buy Yesturday morning to pre-order the phone and I was told to return on thursday the 24th for pickup. That makes sense because the 24th is a Thursday..
and Verizon always releases phones on Thursday's..
Best buy's video capture resolution is very different than Phonearena's video capture resolution specification. I just hope it does 720p and not the specified one stated on Best buys website. I went to a local BB yesterday and was told the 24th is the release date. I just chatted with a best by rep online in their mobile center thing.. I asked when the thunderbolt will be released (24th) and how much the data plan is (extra 10 bucks). If you don't believe me go on best buys website and ask them yourself. 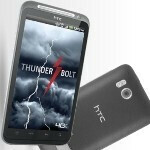 I was Just told by my vzw rep that the release was pushed back to a TBA date. Originally it was the 28th but that set date is a NO go. I kind of don't care anymore. I was initially ready excited by this phone but have lost interest waiting for it. Well, best buy was wrong telling me and other people it comes out the 24th. I asked again and they don't know now.